Welcome to Newmarket's Church On The GO on the World Wide Web! Welcome to Newmarket's Church On The GO – The Pastor's Message. Churchonthego.ca desires to make known with absolute clarity of our love, and desire for Christian unity – amongst all who are sincerely born from above! For many years we have worked behind the scenes with many true Charismatic - believers within the Roman Catholic church. One of my best loved Prayer Partners – and regular speakers at Church On The GO is Charismatic Leader – Brother Joe Turco. Over the years many friendships and fellowship meetings filled with the love of God, have been attended amongst very sincere Bible believing, Holy Spirit filled Charismatic believers powerfully Born From Above! I believe in God, the Father Almighty, the Creator of heaven and earth, and in Jesus Christ, His only Son, our Lord: Who was conceived of the Holy Spirit, born of the Virgin Mary, suffered under Pontius Pilate, was crucified, died, and was buried. He descended into hell. The third day He arose again from the dead. He ascended into heaven and sits at the right hand of God the Father Almighty, whence He shall come to judge the living and the dead. I believe in the Holy Spirit, the holy Christian church, the communion of saints, the forgiveness of sins, the resurrection of the body, and life everlasting. To that end, we declare it more important in WHOM we believe than in WHAT we believe! For many years I have personally wrestled with various positions – concerning the End Times. I will be the first to admit that there are extreme positions in every camp. 1.Preterism – Back loads most of the Book Of Revelation – to the first four centuries after our Lord Jesus Christ – lived, died, rose again and ascended to heaven! 2.Historicism – Is the most honest interpretation of God’s awesome plan throughout the history – of the Kingdom of God! Hebrews 13:8 “Jesus Christ is the same yesterday, today and forever.” ESV Understanding only comes from yesterday! For a thousand years in your sight are but as yesterday when it is past, or as a watch in the night. Psalm 90:4; The prophets have been speaking for a thousand years - do we remember what they have said in the watch of the night? And we have something more sure, the prophetic word, to which you will do well to pay attention as to a lamp shining in a dark place, until the day dawns and the morning star rises in your hearts … 2 Peter 1:19; ESV The lamp has been shining throughout the night until … Today - interpretation is found in the present truth - of God’s Word - by the Holy Spirit! 2 Peter 1:12; KJV Tomorrow - Jesus Christ is the same, yesterday, today and forever. 3.Idealism – Is regrettably not sincere – they never take a clear stand on historical fulfillment! 4.Futurism – Does not consider the Christian martyrs who have shed their blood to give us the Bible and the Revelation we have today. What do you know about the future? Do you know what happened yesterday? You can interpret from the Word of God and by the Holy Spirit – what is happening in - Today’s Present Truth. Futurism – front loads all events into some distant future event, and negates the sacrifice of previous generations and the truth of GENERATIONAL BLESSING – in regards to the Gospel of Our Lord Jesus Christ! The Catholic-Protestant debate has continued for centuries since the time of the milestone Protestant Reformation. Often this debate becomes very heated and emotional because major issues are involved. At the beginning of this new series called Catholic Concerns, it is important to make a few points clear. No matter which side is right, a true Christian is required by Jesus Christ to respect and love others, even his enemies. In fact, according to Christ, one's ability to do this is proof that he or she is really a true child of God (Matthew 5:44). We are also required by God to put away "all bitterness, wrath, anger, clamor, and evil speaking," and to "be kind one to another" (Ephesians 4:32). There is no excuse for slander, nor for the manifestation of "any root of bitterness" (Hebrews 12:15). Jesus Christ, our example, even prayed for his persecutors as He hung upon the cross. Truth has nothing to hide. It can afford to be fair, and to look at all the evidence. Those who resort to sarcasm and mockery do not strengthen their position before any intelligent person. In an age of increasing inter-faith cooperation, many might inquire - Why bring up these issues at all? Why not just put the past behind us, bury our differences, and come together in Christian love? This is a fair question that should be answered. First of all, as I have already mentioned, Christians should love others no matter what. And it's true, Jesus Christ Himself does want His children to be united. In one of His last prayers before His death, Jesus prayed that we "may be made perfect in one" (John 17:23). Nevertheless, there is something else in this prayer that must not be overlooked. Jesus also said, "Sanctify them by Your truth. Your word is truth" (vs. 17). Thus Christ not only wants unity, but also sanctification through the truth. He defines "the truth" as God's "word." In our desire for unity, we cannot afford to sacrifice truth. The Holy Spirit is "the Spirit of truth" (John 16:12). God is "the God of truth" (Isaiah 65:16). Christians are to "obey the truth" (Gal. 3:1) and to be "purified" through "the truth" (1 Peter 1:22). We are warned that many "will turn their eyes away from the truth, and be turned to fables" (2 Tim.4:4). And finally, we are even told that many will "perish because they did not receive the love of the truth, that they might be saved" (2 Thess. 2:10). Thus truth is a life and death matter. It is no secret that the Roman Catholic Church claims to be the true Church of Jesus Christ. She has definite reasons for believing this. She also claims that the Pope is the legitimate Head of Christianity, under Jesus Christ. In spite of ecumenical developments, Rome has not relinquished these claims. The Vatican today is one of the most powerful organizations on earth, and the Pope is also one of the world's most influential individuals. The purpose of Catholic Concerns is to examine these claims in the light of "the word of truth" (2 Tim. 2:15). It hopes to be fair, honest, and as objective as possible. Its primary goal is to help its readers "obtain the salvation which is in Christ Jesus with eternal glory" (2 Tim. 2:10). 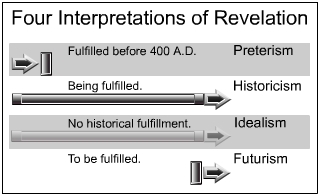 Above: The World history of chart 2, including the Jewish tribulation, is occurring in the “CHRISTIAN AGE” on the left. Jesus returns at the first resurrection “R1” and the wicked are destroyed, just as Noah's flood destroyed all who were outside the ark. This includes the antichrist, or spirit of betrayal. The righteous in Christ are saved, and remain to rule with Jesus for a thousand years. Thanks for reading the Lead Pastor's Message!